Locations: National Gallery, London; Uffizi, Florence; and Louvre, Paris. For other important pictures, see: Famous Paintings Analyzed. This masterpiece of Early Renaissance painting, which commemorates the victory of the Florentine forces led by Niccolo da Tolentino over the Sienese army under Bernardino della Ciarda, was painted by Paolo Uccello (1397-1475), one of the great masters of the Italian Renaissance. It consists of three panel paintings, as listed in the Medici art collection inventory of 1492. The pictures are, from left to right: (1) Niccolo Mauruzi da Tolentino at the Battle of San Romano (c.1438-1440, National Gallery, London); (2) Niccolo da Tolentino Unseats Bernardino della Ciarda (c.1435 to 1455, Uffizi Gallery, Florence); and (3) The Counterattack of Michelotto da Cotignola (c.1455, Louvre Museum, Paris). The triptych was not however commissioned by the Medici family: it was ordered by the Bartolini Salimbeni family in Florence, sometime between 1435 and 1460. But the pictures were greatly admired, not least by Lorenzo de' Medici (1449-92) who bought one, expropriated the other two, then installed them in the large hall of the Medici Palace, known as Lorenzo's room. 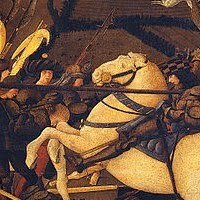 This iconic work of the Florentine Renaissance - now seen as one of the greatest Renaissance paintings of the quattrocento - introduced a new subject into 15th century art - the battle. It is also represents a major experiment in the application of linear perspective, and is one of the few secular triptychs in Renaissance art. The Battle of San Romano took place in 1432, half way between Florence and Pisa, as part of an ongoing war between Florence and the Sienese. Uccello completed these panel paintings some years after the event, partly from his imagination and partly based on eye-witness descriptions. The battle lasted eight hours, and the three images represent different hours of day: the London panel is set at dawn; the Florence panel is set at mid-day; while the Louvre panel is set at dusk. In all three pictures the battle scene is portrayed as an action-packed but chaotic clash of horsemen, lances and debris in a desperate melee, shown through a series of superimposed, intersecting perspective planes. The paintings, each measuring more than 10 feet long, are painted in egg tempera on wooden panels. Sadly, their condition has deteriorated significantly over the years. The three pictures were intended to be hung high up on three different walls of a room, and the perspective in each of them was organized with that height in mind. Which is why anomalies and discrepancies are noticeable when the panels are viewed at normal display height, or in photos. The painting, now in the Uffizi Gallery, shows the Florentine general (recklessly but improbably dressed in a red and gold velvet brocade hat, rather than a protective helmet) directing an attack on the Sienese who had joined forces with the town of Lucca and the ruling Visconti family of Milan. The work has all the pageantry one associates with a jousting match rather than a life-or-death battle. There is no sign of any blood, and only one visible casualty, lying prostrate on the ground. The middle ground of the picture is occupied by a hedge bearing oranges and roses, one of several decorative and stylized details. The perspective used is quite complex. The debris of battle and the dead man are arranged in such a way that the receding lines of perspective, or orthogonals, meet in at least two vanishing points in the foreground of the painting. As in the fresco scenes from the life of Noah in Santa Maria Novella, here too the movement which should animate the scenes seems to be arrested by the isolation of certain details, such as: the elaborate armour, the gilded studs, the leather saddles, the shiny coats of the cavalry horses, and the resplendent mazzocchi headgear. This is the central panel of the triptych, now in the National Gallery, London. The picture shows the decisive combat between the condottieri (generals) of the two armies: namely, Niccolo da Tolentino unseating Bernardino della Ciarda. 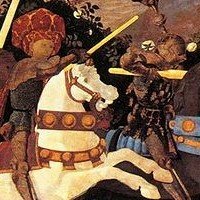 Using unreal colours and light, more in keeping with a Knight's fairy tale, Uccello displays his unusual mastery of perspective while the dramatic nature of the clash between the knights is beautifully presented by his typically intricate narrative. As in the first panel, the background landscape (unearthed after the work was cleaned in 1954) depicts scenes of grape harvesting and hunting. Realism was not on Uccello's agenda. The Battle of San Romano is essentially a propaganda picture, designed to celebrate the military feats of Niccolo da Tolentino. This particular panel, now in the Louvre, records the pre-planned flanking manoeuvre used by Michelotto da Cotignola to seal victory. In addition, it features strong visible decorative elements, including: hosiery of different colours worn by soldiers throughout the picture; the arrangement of the lances, forming a series of patterns that reflect the horses and their riders. Uccello makes full use of painterly techniques such as foreshortening and perspective, while the action crowds out the rural background. Sadly, Niccolo da Tolentino eventually fell out with the Florentine authorities who had him killed and then acclaimed as one of the city's patron saints - all as part of the political struggle against the Medicis. When first painted, many areas of the triptych were covered with gold and silver leaf. Although the gold leaf, like that found for instance on the decoration of the horses' bridles, has remained bright, the silver leaf, found especially on the soldiers' armour, has deteriorated to a dull grey - a sorry contrast with the original dazzle of the burnished silver. Born Paolo di Dono, but nicknamed "the bird" (in Italian: Uccello), this well known artist of the Renaissance in Florence, produced a number of works that are instantly recognizable due to a his heavy-handed use of perspective and foreshortening. Such a highly schematic application tends to make his pictures look rather wooden and his figures toy-like, but his strong sense of narrative design, plus attention to decorative detail, gives his art a beautiful visual feel. His other famous works include The Flood (1447-48, Chiostro Verde, Santa Maria Novella, Florence) - a fresco painting now badly faded, which is noted for his most sophisticated treatment of perspective; The Hunt in the Forest (1465-70, Ashmolean Museum, Oxford); and St George and the Dragon (1470, National Gallery, London). 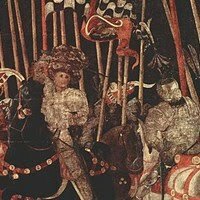 Uccello's current reputation relies less on his (indisputable) innovation in perspective, and more to his decorative art - a skill derived from the International Gothic tradition. In the Battle of San Romano, his decorative talent is most evident in the meticulous detail of the soldiers' chain mail armour, and the leather and metal harnesses of the horses, as well as the colourful touches in his rural backgrounds.  For more about quattrocento fine art painting, see our main index: Homepage.